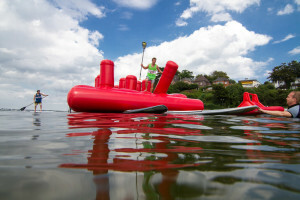 SUPstacle is not just an evolution of water sports, but also a new era for obstacles! It took a whole year of planning, designing, drawing, producing and testing until the first SUPstacle obstacles were ready to use. All obstacles were designed specifically for the harsh SUPstacle conditions and produced under the highest quality standards in Europe. The inflatable elements are stable and stick to the water in a stable way. Nothing can bring them to rest. Based on the fact that the obstacles are inflatable they are easy to transport and you just have to inflate them quickly and they are ready to use. Due to the perfect workmanship and manufacture according to the guidelines of the International SUPstacle Association the obstacles are extremely durable and safe. We are constantly developing new obstacles, also on customer´s behalf. 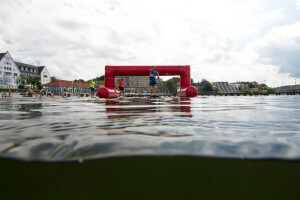 If you have ideas for your own SUPstacle obstacle, you can send us an email. Currently, the following obstacles are waiting for the paddlers and can also be a part of your course. At this obstacle the paddler needs to show the bounce of his legs and has to combine this with his climbing skills. But that’s not all. While the athlete seeks his way over the obstacle the board must be passed under the Ox-fence. Here skill and playfulness must be in harmony. The obstacle with cool refreshment. The paddlers have to fish a drink out off the floating crate and to balance it to the finish. The straight line is too boring? Then you should get to know the floating bottles. Here the athletes have to paddle trough a slalom course. Only with balance and skill you can get through it. The inflatable obstacles provide for mobility of the concept and, what is even more important, for optimum protection against injuries. The SUPstacle course layout is variable so that it is new every time and can be adapted to any event location. 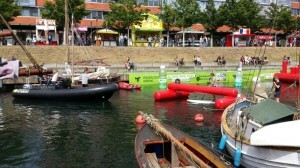 The SUPstacle obstacles demand everything from the athletes! Strength, endurance, coordination, balance – who wants to challenge the SUPstacle course, should master these four things. The true SUPstacle king can more than merely hold the paddle and cross a boring swimming pool. Here the athletes will come to their limits and get to know their fighting spirit from a complete different way. 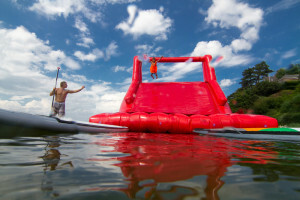 Obstacles with the extra dose of fun, arousing the playfulness in all of us – SUPstacle means fun! !